In Church, first Thursday in the month 10:00–11:30 am. We recently held our first Coffee/Interest morning for Senior Citizens. It was such a success that we will now be holding them on the first Thursday of each month. We begin at 10am. There is no need to book just come along. If you need a lift please contact Pauline Bolding. A successful Holiday club, starting off with coffee and homemade biscuits, then activity’s which included; Glass painting, making Greeting cards, making Jewellery and Flower arranging. Each day a delicious lunch was served. 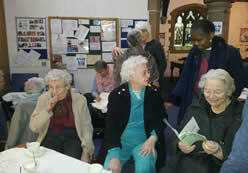 The day ended with tea and cakes and word for the day from our Vicar Ola.